The Hill Country of Texas is big, mysterious and picturesque; a place where mountain springs flow over ancient limestone, carving pools of magnificent beauty. Sculptured from native limestone in authentic detail, Southwest Custom Pools recreates these dramatic sites, merging them with all the features available in luxury pools and spas. Here, timeless beauty meets the latest technology such as commercial grade Gunite shells, state of the art equipment, controls and lighting. The results are some of the most exquisite water features and swimming pools imaginable. From a Zen like water course and reflecting pools to a full size pool and complete property restoration, feature and house are brought together to create a mountain home environment. Step into your own utopia and float beneath dramatic falls, relax in a hot springs spa or simply unwind in a symphony of falling water. Whatever the occasion, the time of day or the season, these works reflect all the moods, colors and splendor of the Hill Country and are spectacular year round. Sophisticated and elegant as they are natural, a place filled with the echoes of a summer pool party may become a setting for a formal evening gathering. Or a place of solitude on an amber autumn day when the only sound is that of wind and water over stone. Building quality custom pools has been a Crites family tradition for 3 generations. We've built over 5,000 pools and still building more. That's exactly the kind of experience people want in a pool builder. Whether you are an existing homeowner, a new homeowner, or are designing your dream home, and you’re looking to create a relaxing environment to escape the summer heat, or maybe you just want to entertain family and friends… we would like to show you how easily you can build a pool-without the hassles, worries or frustrations. Crites Custom Pools is a full service design/build pool company. Crites provides service in the Central Texas and Texas Hill Country area and, depending on the project, can travel throughout Texas. Our talented design professionals work closely with you to create a relaxing pool environment that reflect your taste and perfectly integrates with your property and your lifestyle. Unyielding Pool Construction Standards Crites’ custom quality pools and designs are engineered and built to give you years of enjoyment and worry-free ownership. All of our pool specifications meet or exceed typical industry standards. Building long-term durable pools that have a tremendous, positive impact on the care and maintenance of your pool is our commitment. We look forward to an opportunity to earn your business by designing and building a top-quality pool at a competitive price. Our commitment to customer satisfaction and superior construction is incomparable. If you live in Austin, Georgetown, Round Rock, Hutto, Cedar Park, Lakeway, Leander, Pflugerville, Buda, Kyle, Temple, Waco or anywhere in Central Texas, contact Crites Custom Pools for a beautiful, custom designed pool. We are an award winning pool builder who has completed over 5,000 pool building projects. We are looking forward to building your backyard paradise, or as we call it… Affordable Luxury! In my previous career, I spent 10 years as a luxury custom home builder. In that time, I dealt with many demanding clients and many pool contractors. Unfortunately, most pool contractors seemed to fall short when it came to satisfying my clients. They failed to set and manage their expectations over and over again. This is why I started Cityview Pools. I saw an opportunity to fill a gap in the pool building market by offering, fair pricing, quality product, and above all, excellent customer service and satisfaction. Our clients are our most important marketing tools. We focus on making every pool the best it can be. We are respectful of our clients budget expectations from the start. We manage that expectation throughout design to make sure they are happy before the first piece of equipment rolls on site. Everyday, we strive to build High quality pools , in a timely manor, and on-budget. Those ideals are the foundation from which Cityview Pools was created. Pools are our business, and that includes remodels as well. We take your old outdated pool and turn it into something up to date and fabulous. From re-plaster, to new waterline tile, to decks and water features, Cityview Pools can turn your pool into something you’ll love and be proud to show off! Land Design, founded my Mike Logsdon, is a one stop shop for design and construction specializing in full landscape renovations and complete outdoor living spaces. Mike Logsdon graduated from Texas Tech University in Lubbock, Texas with a Bachelor of Landscape Architecture degree in 1983. While attending Texas Tech, he was invited to join the landscape architecture honor society Sigma Lambda Alpha. Since graduation, Mike has been involved in the landscape design/build industry, creating and implementing award winning swimming pool and landscape projects. Logsdon has completed and earned the rare designation, of SWD – Society of Watershape Designers from the respected – Genesis 3 Design Group that approximately only 50 individuals worldwide have achieved, as well as the CBP – Certified Building Professional designation from the Association of Pool and Spa Professionals (APSP) In 1985, Mike moved to San Antonio, where he has been responsible for the designing, budgeting, estimating, contract negotiating, and implementation for both residential and commercial landscape projects. During this time, he has gained an invaluable reputation as an expert in specialized concrete applications and structural landscape construction (hardscape). As a result of his expertise, travels have taken him to Florida, Georgia, Alabama, Mississippi, Tennessee, Mexico and Spain for consulting, installation supervision, and personnel training in the application of architectural concrete hardscape. 1990 Land Design was founded by Logsdon in San Antonio, Texas. In 1994, he began working with a San Antonio pool company, as an independent/freelance swimming pool designer and consultant, designing, selling and implementing over a million dollars of pool, spas and fountains each year for six years. Mike moved his family and the business to Boerne, Texas in 1998 as most of his work was happing in and around the Hill Country and in 2000 Logsdon decided to bring the construction of swimming pools in house. His education and background in landscape architecture has helped him become one of San Antonioʼs top swimming pool designers, creating hundreds of unique and creative pool environments and outdoor living spaces. He has received numerous local, regional and national design awards for excellence in design. Edgewater Pools, is a custom swimming pool designer and builder serving the greater Austin, Texas area. We have over 25 years of experience in swimming pool construction. Our end-to-end project approach ensures our customers aren't chasing multiple contractors. Whether you need a pool, spa, outdoor kitchen, pizza oven, patio, deck, pergola, or even a cabana, we have the team to make it happen. We can build your pool with sun decks, ledges, waterfalls, a grotto, bubblers, fountains, jets, or slide. Our pools use Pentair equipment, have color changing LED lights, exposed aggregate interiors (often referred to as pebble or quartz tech), and can even include a safety net. We give our pool owners a huge selection of tile and stone to trim out their pool. Our designer renders a 3D drawing to-scale using your plot plan and can even offer video or a 360 degree photo to help pool owners understand exactly what is going to be built. We offer competitive pricing with no-haggle pricing. We have a reputation for building a quality product and doing it quickly. Most of all, we are leaders in innovation, using the most modern products and techniques to build you a pool that will last for years. Get to know us better and you'll see we have deep experience and a fresh approach to the industry. Why You Should Build With Us: -Quality Commitment - We pour thicker walls & only install Pentair equipment. The fine print matters. -Personal Touch - You'll work directly with the company owners who make the decisions. -Full Service - We can fix the fence, install the grass, and even retrofit your sprinkler. No kidding. -Lasting Relationship - We monitor your pool system for trouble year round and check in regularly. For over 35 years, Cascade Custom Pools has built an excellent reputation for fine pool construction in Austin and in the surrounding communities. We have been owned and managed by Hank Thompson since our inception in 1982. Cascade is a very hands-on, locally owned business. Owners, Hank and Theresa Thompson have lived in the Bee Cave-Dripping Springs area for over 30 years. We have many satisfied clients in Austin, Lakeway, Westlake, Dripping Springs, Wimberley, San Marcos, Cedar Park, Jonestown, Lago Vista, Spicewood, and other areas in and around Austin. Brad Sharpe Pools is a small family owned business that’s been serving San Antonio since 1988. We build a limited number of high-quality pools each year, and pride ourselves on our craftsmanship, our creativity, our reputation, and our attention to detail. Our goal is to give you the absolute best in design and quality in every aspect of your project, and make you absolutely delighted in the process. We welcome a no-obligation conversation about your desires and ideas for converting your backyard into something spectacular. Call us at 210-822-5620. In 1996 John Pack opened John Pack Custom Pools and began building custom swimming pools for the Georgetown, North Round Rock, and Central Texas market. Now, hundreds of pools later, the Pack Pools brand is trusted locally and respected nationwide. Our luxury pool designs, quality craftsmanship, and customer commitment have earned us accolades from major industry organizations like the Association of Pool and Spa Professionals (APSP) and the GAVA (Global Aquatekture Visionary Awards). Perhaps our greatest recognition has come in the form of hundreds of personal referrals given by past clients to their family and friends. John Pack Custom Pools has experienced many exciting changes since our start in 1996. Our portfolio of luxury pools has expanded, our staff of Georgetown pool veterans has grown, and we continue to evolve alongside the industry. Our personal approach and commitment to an enjoyable client experience remain unchanged. Our clients continue to benefit from the one-on-one attention of our owner, John Pack, throughout every step of the design and construction process, and we continue to offer a level of service unparalleled in the Georgetown custom swimming pool market. For the perfect blend of style, craftsmanship, and service, look no further than John Pack Custom Pools, Georgetown’s smart choice. We approach every new client with the aim of developing a long-term relationship of mutual trust and amity. We understand the personal strain that comes with building a custom swimming pool, and we go out of our way to carry the stress by handling all of the paperwork and closely managing each step of the process. Our clients know they can rely on us to deliver superior quality and service every time. Many have honored us by returning for all of their luxury pool and outdoor living needs. We maintain a staff of the finest craftsmen in the industry locally. Completing all work in-house with our own trusted experts ensures superior quality while also allowing us more design flexibility and complete control of the construction process. Pools & Spas, Swimming Pools and Spas. Athena Pools has built an excellent reputation for fine Swimming Pools and spa construction in Austin and in the surrounding communities. Athena Pools designs pools & spas with a variety of features, conveniences and technologies, designed to work together to create a total backyard environment. Our pools create the perfect setting for relaxation. We have many satisfied clients with more than 95% of our business coming from client referrals. We look forward to meeting the needs of new clients in the Austin and surrounding area with our services. We are a Design Build outdoor living building company specializing in swimming pools, landscaping and outdoor living structures. Bradley Signature Pools is an award winning custom pool and patio designer / builder based in, and serving the New Braunfels TX and surrounding hillcountry area. Since 2012 Bradley Signature Pools has been a preferred choice for many New Braunfels area custom home builders and residents seeking quality, unique and stylishly designed swimming pools and patios. Owned by New Braunfels native designer/builder Brad Babel, Bradley Signature Pools has been recognized for award winning design, quality in construction and efficiency, and an unsurpassed level of personal service and communication. Bradley Signature Pools is a licensed, bonded, and insured general contractor and registered and licensed with the city of Seguin, New Braunfels, San Marcos and San Antonio Texas. BSP is an A+ rated, accredited member of the Better Business Bureau. The resources available through Build Your Own Pool help homeowners with the steps of designing and building a backyard pool. Homeowners can expect help with all of the following: The pool planning process: Pool designers who can help you design your own pool to fit an existing backyard. Permit resources, such as links to applications and guidelines for local cities and counties. Links to local structural engineers who can provide homeowners with the engineering they need to submit swimming pool plans to the city or county. Contractor selection: once a pool has been designed, Build Your Own Pool will help with the process of sending the plan out for bids for each stage of construction. What exactly do Dripping Springs pool builders do? If you are planning for a new pool in Dripping Springs, TX, a swimming pool builder will analyze your outdoor space and your aesthetic wishes to determine an appropriate design for your yard, installing it once the plan is developed and approved. Once installed, some pool companies in Dripping Springs, TX can handle the necessary cleanings, water testing, renovations and equipment replacement or repairs for your pool or spa. If not, many can also suggest Dripping Springs, TX swimming pool contractors or maintenance services to help with upkeep or repairs down the road. Here are some related professionals and vendors to complement the work of swimming pool builders: Garden & Landscape Supplies, Landscape Architects & Landscape Designers, General Contractors, Landscape Contractors, Solar Energy Contractors. Before hiring a swimming pool construction company to create your new Dripping Springs, TX pool, determine how you'll be using it. Will it be for fun or for lap exercise? Will the primary users be children, adults or a mix of the two? Knowing the use can help you find Dripping Springs pool builders who shares your aesthetic. 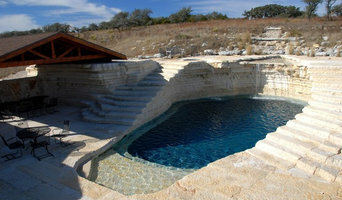 Once you find swimming pool builders in Dripping Springs, TX who share your style, research is critical. Review customer references and comments, collect at least three to four estimates to compare, meet with potential Dripping Springs pool designers and builders in person and ensure that they are Texas certified service professionals and licensed with the registrar of contractors before making any final decisions. In addition, get a sense whether they plan to complete the pool installation and be done with it, or whether they seem interested in building a long-term relationship with you. Be wary of the former: it's likely a reflection on the level of quality of the pool construction they do. 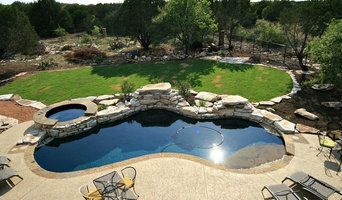 Find a Dripping Springs pool contractor or designer on Houzz. 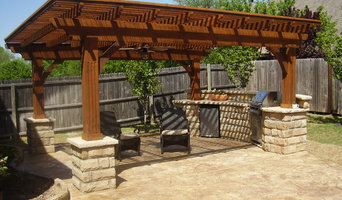 Narrow your search in the Professionals section of the website to pool builders in Dripping Springs, TX. You can also look through Dripping Springs, TX photos by style to find a pool or spa you like, then contact the local pool company who designed it.